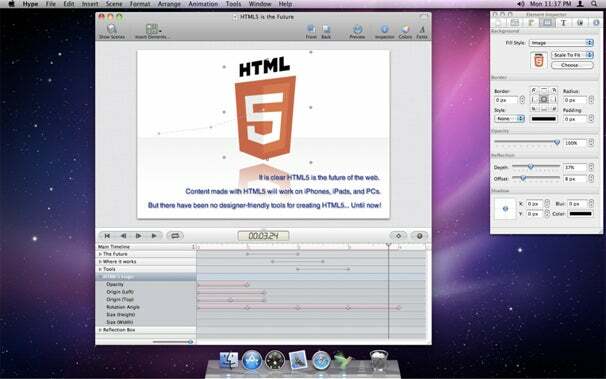 Animators and designers have long had to rely on Adobe’s Flash and Dreamweaver software to create animation and interactive experiences for the Web. While HTML5 offers an alternative, there’s been no easy tool for creating it—until now. Tumult’s Hype, released on Friday, offers creative professionals an easy-to-use WYSIWIG editor for creating interactive Websites, animations, and more, all encoded in HTML5. Hype boasts that no coding knowledge is required to use the application; indeed, it presents the user with a WebKit-rendered preview pane and a rich text editor for adjusting shapes, text, and images. But if you’d like to take a peek under the hood, it’s easy enough to access the code for each individual element. Animations are keyframe-based and can be controlled one of two ways: manually, or by using the application’s Record option. With Record, you can adjust anything on your canvas, and Hype will automatically render the transitions needed to create the animation. You can isolate individual pieces of elements—only adjusting the shadow or reflection on an image animation, for example—and even use multiple timelines for greater control. Exporting, too, is a snap: Hype will automatically generate a folder with all the necessary elements and code for you to place at your leisure. You can even upload a Hype project directly to Dropbox and preview your Website there. Hype is available solely on the Mac App Store for an introductory price of $30. It requires Mac OS X 10.6.6 or later.